#BadPsychics: Brighton Gays Say Shame on Sally Morgan! 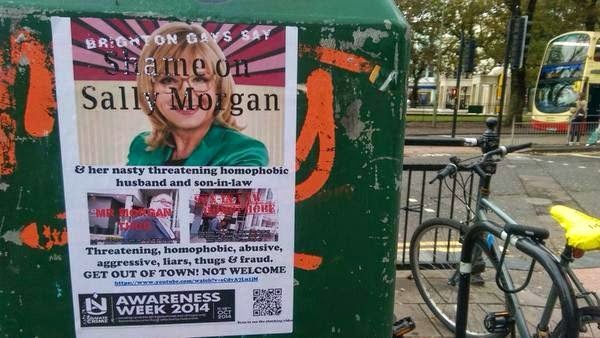 Yesterday Brighton Gays put up the following posters telling Sally Morgan she was no longer welcome in Brighton, along with various Gay groups who contacted Sally Morgan regarding her husbands vile homophobic actions, this is why she "fired" him and her son in law. "Stand against hate speech and bigotry by protesting the "Psychic Sally" Tour at the Theatre Royal, Brighton. By refusing to apologise for her family's homophobic tirade, Sally Morgan condones bigotry and hate speech. You have the power to stand against such behaviour and force change. 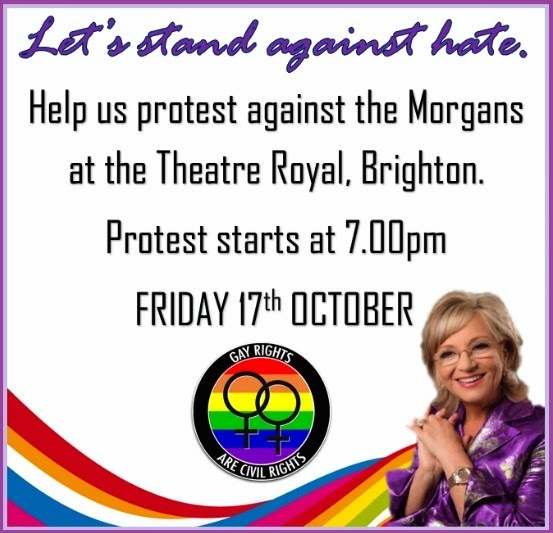 There will be a silent and peaceful protest near to the Theatre Royal, Brighton on the 17th October (this Friday) at 7pm whereby people can protest the appearance of Sally Morgan. Remember that for every penny paid to Sally at the theatre, her family (who are also her paid staff) will receive a percentage. This means that you are actively handing money to bigots. We respect the right of the audience members to attend the show, we also respect the right of the theatre to allow their audience safe entry. There will be no attempt to disrupt the show, we will simply be a large and unmissable presence so that anyone attending the Sally Morgan show on Friday night will be made aware of the situation. Sally's PR team have chosen to remove any negative comments from her Facebook page and to leave only those that defend her family's behaviour. She feels that the behaviour was justified because she claims that she felt scared for her life. Thousands of people REALLY fear for their lives when confronted by bullies peddling hate speech as demonstrated by John Morgan and his son in law, Daren Wiltshear. We have heard nothing from these two men and we demand an apology. If you agree with these sentiments, we need to see you on Friday!" It was only after this did Sally Morgan decide to "fire" her husband and son in law, but it seems some people will continue their protest. ANYONE claiming to be psychic is in one, or both, of only TWO states. Whilst the majority of viewers where this post is made will be pro-psychic, those who wish something to be done about these thieves should surely make a greater effort to advise ALL their contacts they can now do something positive through the link above. How many of the con artists display the disclaimer, “For entertainment purposes only”? In any event, they should not be permitted to influence the feeble-minded or vulnerable people who might believe such nonsense! Whilst most of them look and sound incredibly stupid to those with more than two firing synapses, one can only assume these thieves they simply don’t care because they are making so much money,. Trying to con others is one thing but, if you are trying to fool yourself, you need urgent help. NOW, at last, YOU can actually DO something positive! Click the link above and sign the petition! Join the campaign to stop these evil individuals stealing from so many such unfortunate individuals. Email your M.P. and request the issue be raised in parliament to prohibit these thieves from advertising or performing. If ALL thieves should be imprisoned, why does the government condone this huge (and growing) group of con artists stealing with impunity? They should also be imprisoned and their vast profits applied to support victims. It’s nothing short of legalised theft! The truth is posted everywhere that these con artists should be in PRISON like ANY con artist so isn’t it strange why they never try to sue me if they claim they really possess such a supernatural skill ? ! Check THIS out ! Going to go VIRAL ! ! ! !